The problem when you want to do a movie that costs a bit of money, whether it’s because the subject demands it or the book you’re adapting demands it, is that there isn’t much choice in Europe, you have a limited budget on some subjects, there are only movies like Astérix that can transcend those limits because it’s a very big property but when you want to do an “action” film comparable to the American ones, you can’t be in direct competition with them and you can’t finance them yourself. We can’t put 250 million dollars in a movie like they do so we can’t be competitive with them. The only way to be released there is to interest them in producing, but control the product. So it’s just a question of letting the Americans in as partners on films which they don’t necessarily control. Well, they’ll control the release in the US, but not necessarily in other countries. And that enables them to cut down on their expenses, which are huge, and it enables us to find financing elsewhere than Europe, where there is a limit to what budget we can have on some movies. The difference is that the European version is much better than the American one. The difference is that Americans have a different culture than ours and they chose to amputate the film…well cut out things which didn’t seem necessary to them to try and keep the most frenetic pace possible, which has its advantages and its disadvantages [ironic smile]. What Kassovitz says is a sad, but true observation of the way American movie studios think. The only way they will permit a movie to have a wide release on their territory is if it’s in English, if they’ve participated in the production, and if they can reshape it to look like something they think the public wants to see and thus make a quick buck. When the truth is all they need to do is spend a little on good advertising and reap the rewards. People, American or not, WILL go see a movie if it’s properly marketed, even if it is subtitled and doesn’t contain a car chase and a happy ending. I wonder how Michael Bay (Transformers) would react if some French editors cut out his spectacular action scenes and replaced them with shots of the characters just standing around deep in unspoken thought. Kassovitz hates the Fox version of his film, but he’s apparently satisfied with the Studio Canal one. Most professional reviewers trashed the film (or at least the Fox cut), calling it a “poor man’s Children Of Men“. While the two films share some similarities, being set in a dystopian near future and dealing with a man charged with taking a girl from point A to point B, the similarities end there. Each movie stands on its own, and both have their own appeal. As it is, Babylon A.D. has some very good acting, an interesting multi-layered storyline, some great cinematography by Thierry Arbogast (whose work on Catwoman was one of that movie’s sole redeeming features), incredible visuals and pretty good action that isn’t generated by special effects. To be honest, French critics didn’t exactly fawn over the film, but they weren’t as harsh as their American counterparts. I very much enjoyed the Studio Canal cut of the film, and I have a feeling that Americans would have preferred it. It doesn’t equal Alfonso Cuarón’s masterpiece in greatness, far from it, but it’s very solid sci-fi entertainment. Providing another, even better director’s cut doesn’t come out, seek out this version when it gets released on DVD in about six months (who knows, it might even get released in the States!) and give Babylon A.D. a second chance. Personally, I give it a B+. This entry was posted in American Films, French Films, Science Fiction Movies and tagged 20th Century-Fox, Alfonso Cuarón, Astérix, Babylon A.D., Babylon Babies, Catwoman, Children Of Men, Find Me Guilty, FOX, Gothika, Mathieu Kassovitz, Maurice Dantec, Maurice Georges Dantec, Michael Bay, Studio Canal, Thierry Arbogast, Transformers, Twentieth Century-Fox, Vin Diesel by Mr Hollywood. Bookmark the permalink. an extremely neatly written article. I’ll be sure to bookmark it and come back to learn extra of your helpful information. Thanks for the post. I will definitely comeback. 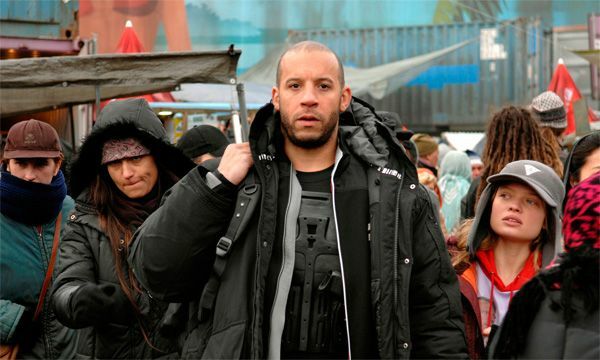 I really liked Babylon a.d. and i wish they would make a second one to accompany the first. The whole film was great and i would really like to see the sequel. I give the movie an A.
Babylon A.D. was a great movie I loved watching the film, it truly was a action packed film. Vin Diesel’s, Acting was awesome in the movie. I would like to see even more from this Sci-Fi movie because the ending left off where Toorop is left to take care of her two children, and I am wondering what kind of powers they will have, Aurora survived a bomb explosion, with the help of the infants can only imagine what they would be able to do as they grow up!